Sakai Guides and DocumentationSakai Basics Site InfoHow do I create groups? Once groups are created, group aware tools such as Assignments, Email, Resources, or Tests & Quizzes have options for restricting access by group. Click on the Manage Groups tab from Site Info tabs..
Zoom: Create New Group screen with Group Title, Student 3, and right arrow highlighted. Enter a Group Title for the group. 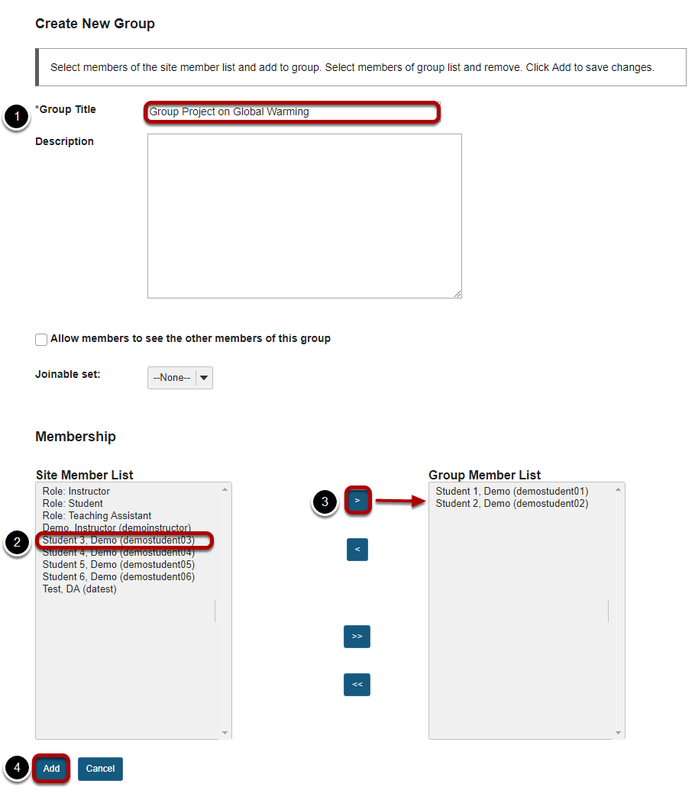 Once you have selected all of the desired group members, click on the Add button to create the group. Zoom: Create Joinable Set data entry screen with data entry fields and Add button highlighted. 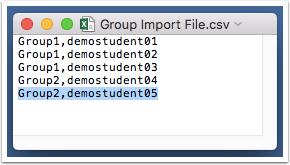 You will need to enter a Set name for the set of groups. Each group will begin with the same name and end with a unique number. Indicate the Number of groups. Enter the Max members per groups. Click Add to create the joinable set. Note: Students will need access to Site Info to see and join any joinable sets of groups. Zoom: Create groups by role scrren with checkboxes highlighted. 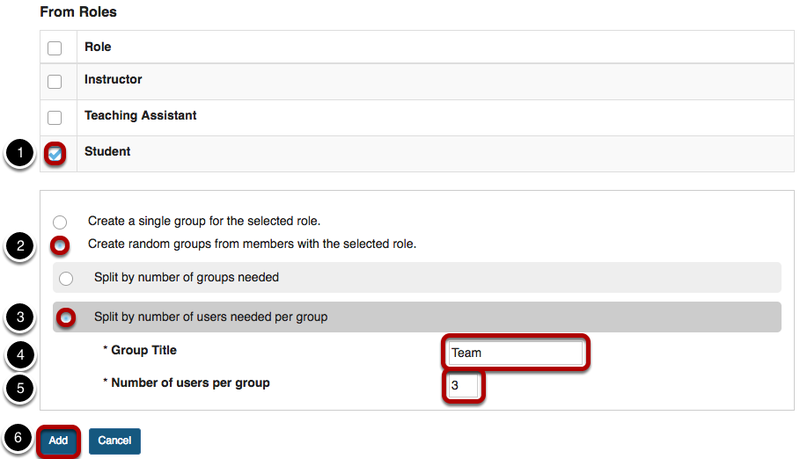 To create separate groups for different user roles in the course, select one or more roles and then click the Add button. Tip: Click the Role checkbox to select all roles at once; click again to de-select. Zoom: Create random groups screen with settings and Add button highlighted. 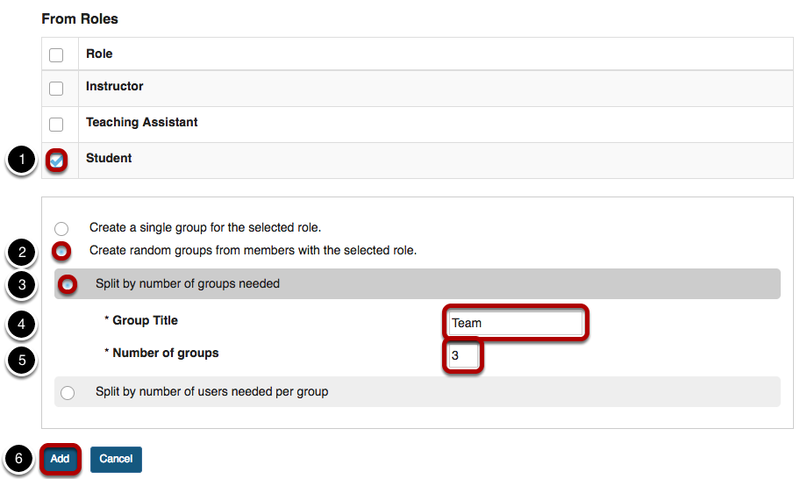 Select the Create random groups from members with selected role radio button. Enter a Group Title. This title will serve as the basis for all of the group names. Unique numbers will be appended to the title. Click the Add button to auto-generate your groups. Zoom: Create random groups by number of users per group. Once you have uploaded your file, click the Continue button. Prev: How do I delete a class roster? Next: How do I use groups?